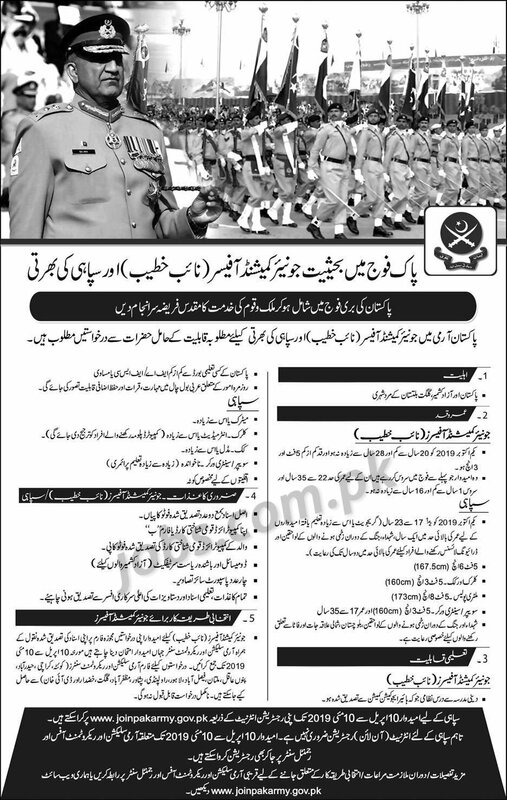 Join Pak Army as Junior Commissioned Officer & Sipahi including Clerk, Military police, Cook etc. 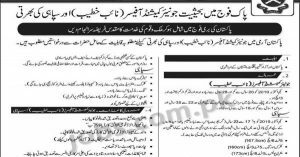 Pakistan Army has issued latest notification for recruitment Sipahi and Junior Commissioned Officers (Naib Khateeb) today. Required education, physical standards and age limit requirement are as following. Eligible candidates are encouraged to apply to the post in prescribed manner. Incomplete, late, hand written submissions/applications will not be entertained. Only shortlisted candidates will be called for written test/interview. See the notification below to see vacancies/positions available, eligibility criteria and other requirements. Eligible candidates must submit applications on or before 10th May 2019.